a tablet computer, designed to be hand-held. 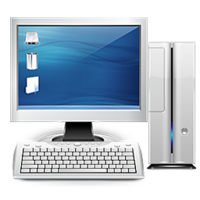 In the 2010s, PCs run using an operating system (OS), such as Microsoft Windows, Linux (and the various operating systems based on it), or Macintosh (macOS). Early computer owners in the 1960s, invariably institutional or corporate, had to write their own programs to do any useful calculations with the machines, which even did not include an operating system. The very earliest microcomputers, equipped with a front panel, required hand-loading of a "bootstrap" program to load programs from external storage (paper tape ("punched tape"), tape cassettes, or eventually diskettes). Before long, automatic booting from permanent read-only memory (ROM) became universal. In the 2010s, users have access to a wide range of commercial software, free software ("freeware") and free and open-source software, which are provided in ready-to-run or ready-to-compile form. Software for personal computers, such as applications ("apps") and video games, are typically developed and distributed independently from the hardware or OS manufacturers, whereas software for many mobile phones and other portable systems is approved and distributed through a centralized online store. Since the early 1990s, Microsoft operating systems and Intel hardware have dominated much of the personal computer market, first with MS-DOS and then with Windows. Alternatives to Microsoft's Windows operating systems occupy a minority share of the industry. These include Apple's OS X and free open-source Unix-like operating systems such as Linux and BSD. AMD provides the main alternative to Intel's processors. ARM architecture processors "sold 15 billion microchips in 2015, which was more than US rival Intel had sold in its history" and ARM-based smartphones and tablets, those are also effectively personal computers – though not usually described as such – now outnumber traditional PCs (that are by now predominantly Intel-based while a small minority is AMD-based).